When Mary was about to give birth to Jesus, the three wise men saw the star in the East and venture to go and see the baby Jesus. They told King Herod that Jesus was born in Bethlehem in Judah. Then King Herod called in the three wise men to find out the exact time the star appeared. 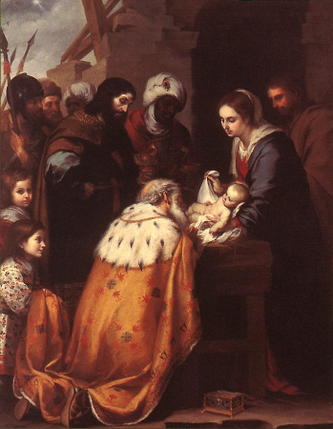 King Herod said, “Find the young child and then come back and let me know so that I can go and worship Him also.” The three wise men promised to do King Herod the favor. After that, they set out to search for the place where baby Jesus was born and they saw the star in the East. The star went on before them and came to stop where the baby Jesus was. The three wise men followed the star in the East and they finally came to the horse stable where Jesus was born. When they saw the baby, Jesus, with his mother Mary, they were very happy and praised God. The baby was laid in a manger and wrapped with swaddling clothes. They brought out gifts of gold, frankincense and myrrh and presented it to Him. After that, the three wise men bowed down and worshipped Him. The three wise men were warned in a dream so that they don’t return to Herod. Then they took a different route and went back to their own country.